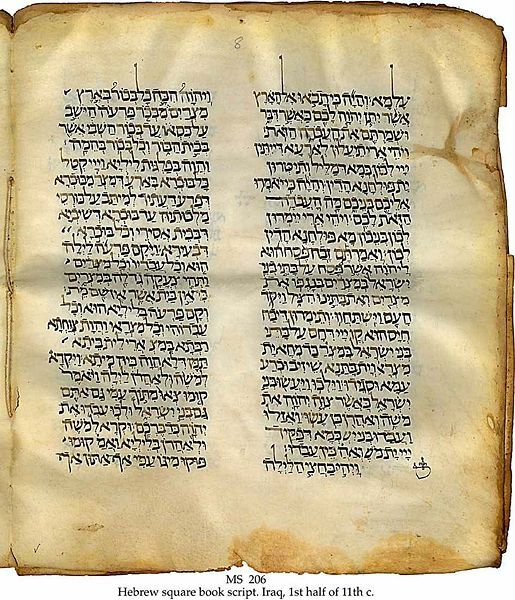 11th century manuscript of the Hebrew Bible with Targum. The Schøyen Collection MS 206, Oslo and London. Hebrew square book script. Iraq, 1st half of 11th c.
MS in Hebrew and Aramaic on vellum, Iraq, first half of 11th c., 8 ff., 39x33 cm, 2 columns, (25x25 cm), 23 lines in a large Hebrew square book script, by a scribe perhaps originating from the Maghreb (North Africa probably Tunisia). Provenance: 1. The Genizah of a Kurdistan Jewish community, North Iraq (until 1950/59); 2. Dr. Fischel, U.S.A.(from 1950/59 ; 3. Bernard Rosenthal, San Francisco. Commentary: The Aramaic translation is verse by verse. Among the earliest group of surviving Hebrew targum Bible MSS in codex form. Exhibited: XVI Congress of the International Organization for the study of the Old Testament. Library of Law Faculty, University of Oslo, 29 July - 7 August 1998. Elizabeth G. Sørenssen & Jingru Høivik: photography and formatting.